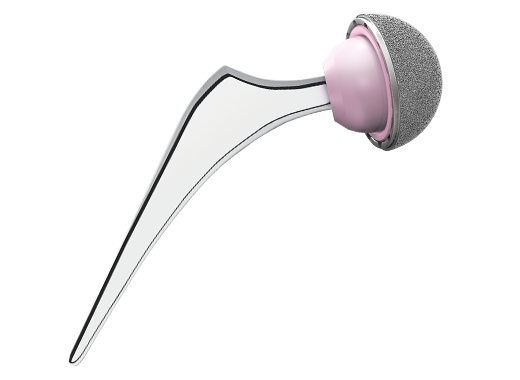 The C-STEM AMT Triple Taper Stabilised Hip builds upon the clinical success of the original C-STEM Triple Taper Stabilised Hip and its unique triple tapered highly polished design2-4. The functional intra-medullary geometry of orginal C-STEM has been maintained whilst the extra-medullary geometry has been enhanced with a raised lateral shoulder, for better visualization during insertion, and the addition of the 12/14 ARTICUL /EZE® mini-taper. This taper provides the surgeon with increased versatility due to its compatibility with the extensive DePuy Synthes Joint Reconstruction femoral head and acetabular portfolio. 1. Husby OS. A Randomised, Prospective, RSA Post Marketing Study Comparing SmartSet HV and Palacos R Bone Cement in THA, presented to the Norwegian Orthopaedic Association (NOA), Oslo, Norway, October 27th/28th 2005. 2. Wroblewski BM, et al. Triple Tapered Polished Cemented Stem in THA. J. Arthroplasty. 2001;16: 37-41. 3. Wroblewski BM, et al. Triple Tapered Polished Cemented Stem (C-Stem) in THA. Follow up to 10 years. J. Bone Joint Surg. 2006;88- B:234: 1. 4. Purbach B et al. The C-Stem in Clinical Practice Fifteen-Year Follow-Up of a Triple Tapered Polished Cemented Stem. J Arthroplasty 2013; 18: 1367-1371.